Only three weeks left until Deadly Notes is released! I don't know about you, but we're excited. So excited, in fact, that we're giving you a whole new trailer! You can find it on the home page, on the new Trailers page, on YouTube, or right here. We've come a long way since the end of May when Deadly Notes was cast, and there's still a long way to go before the release date, October 31st! However, our editor Marc Hall sent me a rough cut of the entire film (minus the end credits) and it looks amazing. Of course there's still plenty to do, but I wanted to let you guys know that we're all working hard to get this film ready for Halloween, and that progress is being made! An Editor and a Poster! For various reasons, we've had to find another editor to take on post-production. I'm pleased to announce that Marc Hall has recently agreed to work on the project, and he says he can keep us on schedule! You can find some of Marc's previous work here. Woohoo! Deadly Notes now has a website! All the updates will be right here! 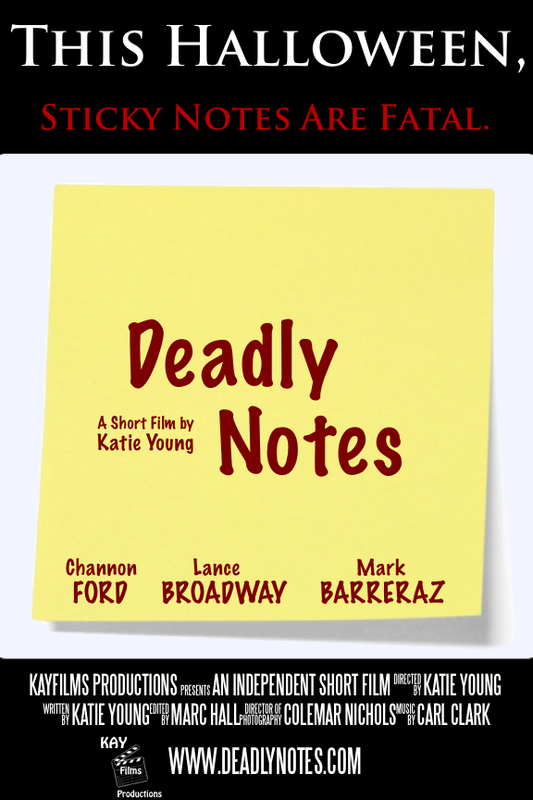 I'm Katie Young, the writer, director, and producer of Deadly Notes. I'll be running this website and blog to keep you updated on the progress of the film.